The Dongria Kondh and other forest dwellers of Niyamgiri are determined not to allow London Stock Exchange-listed Vedanta to mine in their sacred hills. Till the magazine went to print, five palli sabhas (gram sabhas) had rejected the mining proposal, saying it infinges on their cultual and religious rights over the hills. But it seems the government is trying every possible way to bend their decision in its favour. The palli sabhas are being held in 12 villages following the Supreme Court’s order of April 18 which empowered the forest dwellers to decide if bauxite mining within their habitat will affect their cultural and religious rights. The court while deliberating upon a case brought by Orissa Mining Corporation against the Union Ministry of Environment and Forests said the forest dwellers can also make fresh claims over forest resources under the Forest Rights Act (FRA), 2006. To ensure this the state government called for fresh FRA claims between June 1 and 14. Going by the norm, the claims should have been first considered by forest rights committees at village, sub-division and district levels and then approved. But in a hurry to settle the claims before palli sabhas are held, the government formed a joint team, comprising revenue inspectors, foresters and welfare extension officers, for evaluation and settlement of claims. Residents of Kesarpadi village allege that instead of settling their claims, the government has limited their rights. The verification report for Kesarpadi, a copy of which is with Down To Earth, supports their allegation. On July 6, the team visited the village and asked the residents about their agricultural plots, water sources, places of worship, grazing land and cremation ground. The report states that the villagers were explained “lucidly” in their local Kui language, places were demarcated and that none of the residents present made any further demands on the forests. Crucially, the report ignores their claims on religious and cultural rights based on local deities. The supreme deity of the forest dwellers, Niyam Raja, is relegated to a “temple located on the Niyamgiri Pahar”. The report ignores the significance of Niyam Raja for the Dongria Kondh who consider him as their keeper and protector. They say Niyam Raja’s territory spreads across and beyond the proposed bauxite mining site of Niyam Dongar. “They said they were giving us everything we asked for. So I signed the report,” says Suku Kutruka, president of the village forest rights committee. He laments that he was fooled because he cannot read Oriya. Kesarpadi residents later rejected the settlement report at the palli sabha on July 22. In three other villages the government claimed that the residents had not filed any claims or had faulty claims. 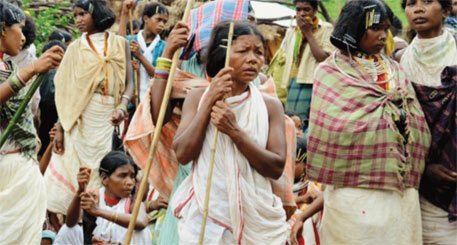 But the residents rejected the government’s settlement reports, saying they have rights over the entire Niyamgiri. So far, Serkapadi is the only village whose residents have approved the settlement reports because they say they did not understand the documents. Shankar Gopalakrishnan of Campaign for Survival and Dignity says the Odisha government has violated rights of forest rights committees by sending officials to prepare verification and settlement report. Moreover, the time given by the government to file the claims was not sufficient. State manipulating records to help Vedanta?